In the late 1940s, Jackson Pollock developed a revolutionary form of Abstract Expressionism by dripping, pouring, and splashing paint onto large-scale canvases. Emphasizing the expressive power of the artist’s gestures, materials and tools, Pollock often applied paint with sticks, trowels, and palette knives instead of brushes. With no apparent beginning or end, top or bottom, his works imply an extension of his art beyond the edges of the canvas. 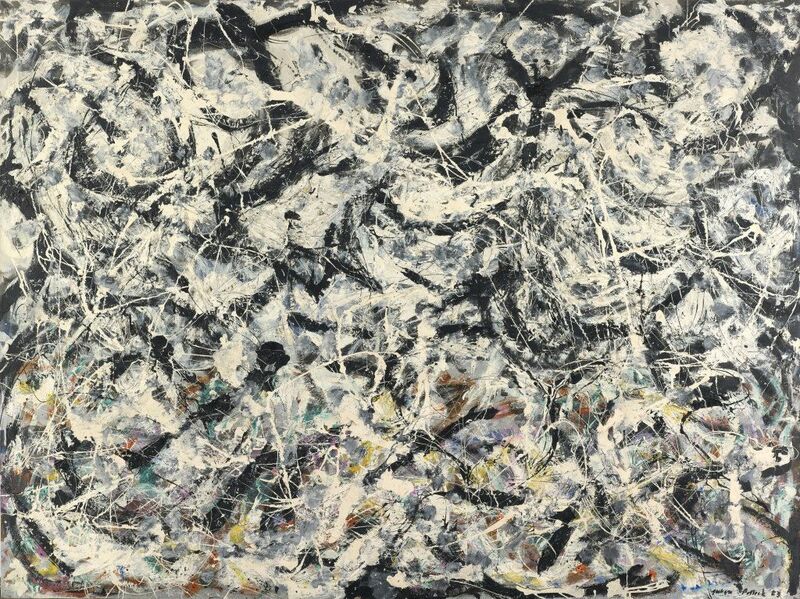 Among the last great purely abstract paintings Pollock made before his untimely death, and a quintessential example of action painting, Greyed Rainbow is predominantly black, white, gray, and silver; in the bottom third of the canvas, however, the artist thinly concealed orange, yellow, green, blue, and violet. The title presumably refers to these grayed sections of hidden color.